One of the funnest things about moving is getting to know your new neighborhood and finding that perfect store to go to for groceries. Mr. B and I ventured out a few weekends ago and, because I needed a few items, stopped into the local Safeway store. I haven't shopped at a Safeway in quite a while because there wasn't one really close to our old house but let me tell you! I have found "my store". This Safeway had wide aisles, nice lighting and we both agreed, it just felt like a small town market. They also displayed the food so nicely! Not all thrown about like a gorilla had been pawing through it. 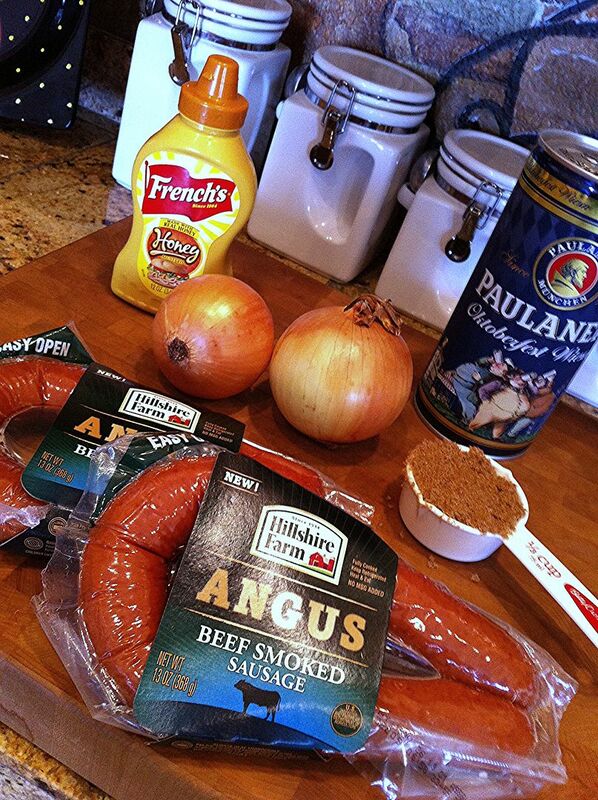 And that is why these packages of Hillshire Farm Angus Beef Smoked Sausages caught my eye! Now I don't know about you but, with working full time, moving and just life in general, we get so busy! Those of you that have kids and their activities? I have no idea how you do it! Those are the times I rely on my trusty slow cooker and quick and easy recipes so that when we finally do get time to sit and eat, it's hot and ready! 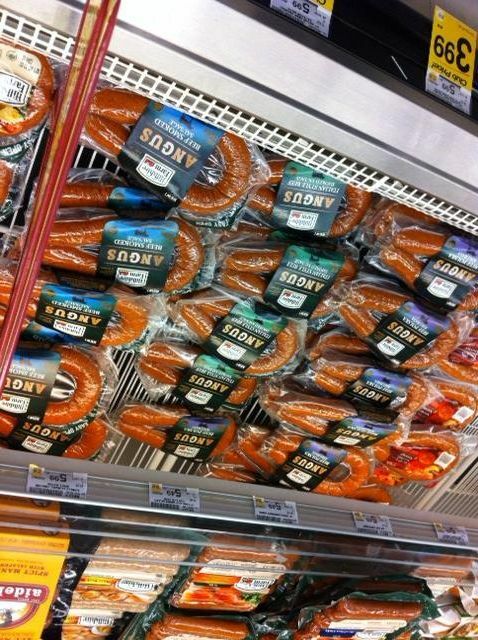 Which brings us back to those sausages! 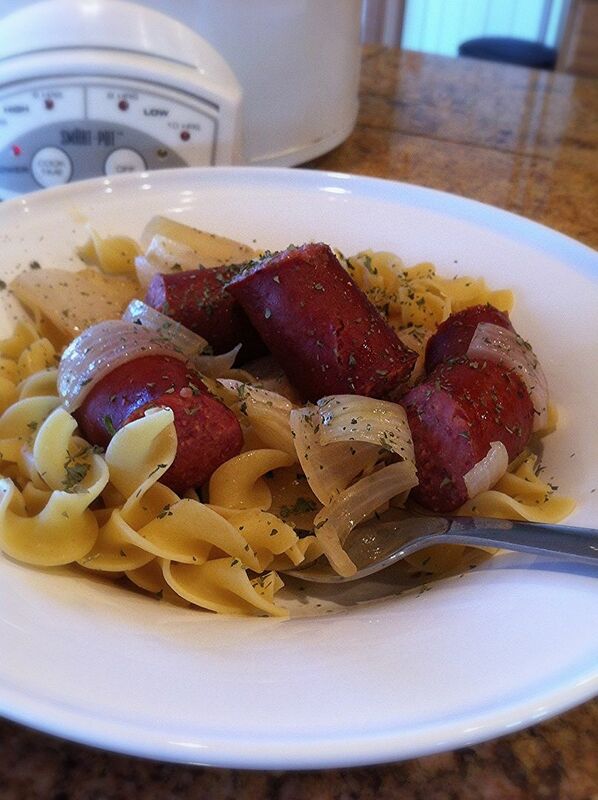 One of Mr. B's favorite slow cooker meals is Slow Cooker Sausage & Onions. You probably have all of the ingredients on hand but if you don't, this is your lucky week my friends because right now,if you have signed up for the Just For U program at Safeway stores, when you buy three Hillshire Farm products, you’ll save $3! Hurry though, this offer ends Saturday October 19th! Combine honey mustard and brown sugar in slow cooker: whisk in beer or chicken stock. Add sausage pieces and onions. Stir to combine. Cover and cook on low 6-8 hours. Serve over cooked egg noodles. For our dinner this night I added a romaine salad with kalamata olives and Gorgonzola cheese crumbles. would have been perfect but, hey, I'm busy, remember?! I lost track of time and forgot to pick some up LOL! you could interchange them very easily with this recipe and make it your own. what is your go-to fast and easy recipe for those super busy times in life? For more great recipes for any meal, be sure to check out the Hillshire Farm website and follow Hillshire Farm on Facebook and Twitter! This looks like a nice and easy meal to make.. The salad looks really good too..
My husband loves sausage and peppers, and I never thought to make it in the crock pot! Thanks for the idea! That looks delicious! I'm totally going to have to try that! Whoa this is an awesome idea! 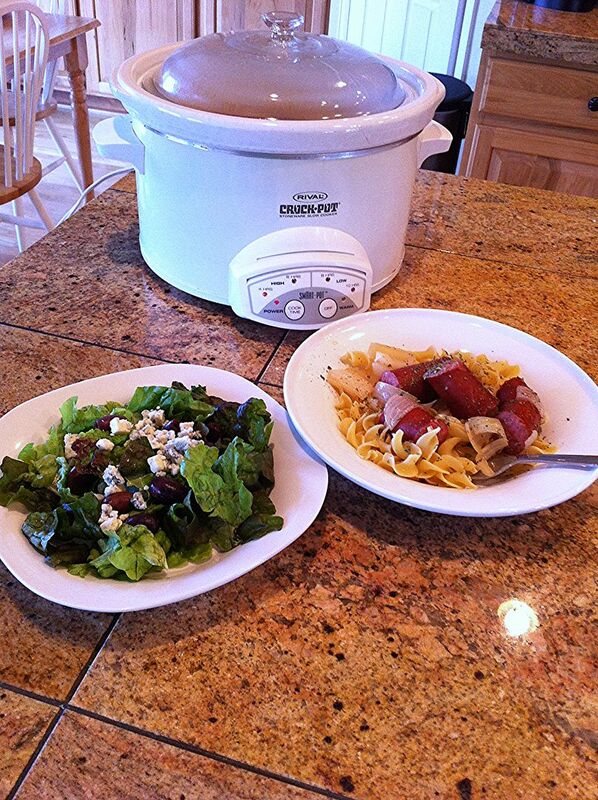 I am always looking for easy crock-pot creations. Pinning it for another day! Laura - There is a beer called Red Bridge that is gluten free. It's available in my area, but I'm not sure if it is national. This would be a great recipe to make for my husband's rugby team! I think they'd love it! I always need a good Crock Pot recipe! Thanks! Mmm looks good! And I love that you can make it in a slow cooker! Thanks Kathe. I like this recipe. Simple and I know it's good. I use to make sausage with cabbage all the time when my kids lived at home. Fast, easy and so good!!! Such an easy recipe! Thanks for sharing! A comfort food I can add to my recipe box! I used to shop Safeway years and years ago before they moved out of the area. Thanks Kathe. Ooh! I'm all for easy and delicious recipes and you knocked it out of the park with this one! Oh my yummy! This looks great! G'day! Angus beef and Angus beef sausages are one of my faves, true! Your dish looks very winter warm and comforting too! Thank you for sharing! I've been looking for more slow cooker recipes! I found your post on the Friday Flash Blog. Oh my gosh! We love smoked sausage! I'm pinning this to try soon. I've never tried it with noodles...we always use rice. This will be a nice change and I love that it's a crock pot recipe! Yum! Your sausage on top of those steaming noodles looks so delicious. Thanks for sharing this dish with us on foodie friday. my slow cooker is my BFF. adding this to our recipe box! looks so good. wish we had a safeway near us. the large aisles sound amazing! thanks for linking up to the all things pretty party! This would be a winning dinner with my hubby! I will have to give it a try! I would love if you would come link up with me and enter my giveaway, it ends Wednesday! I do not eat meat but my husband loves it! I will cook meat for him but do not like having to handle it too much. This looks like a great one for me to make for him and I am sure he would be thrilled! I have never served kielbasa with pasta, hmm now this I have to try! Thanks for sharing at the Pinworthy Project Link Party. 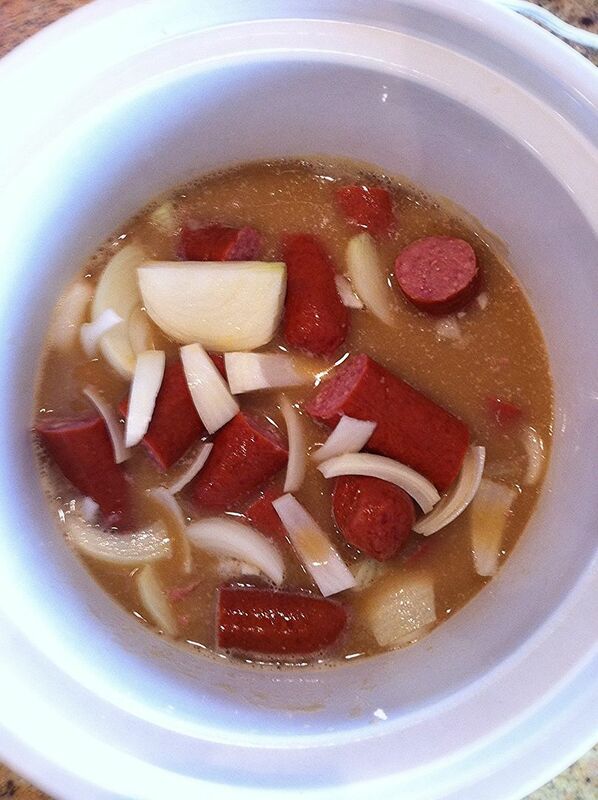 Kathe, I just made a crock pot sausage dish that had apples and sauerkraut in it. It was quite yummy. I need to do more blog cooking posts. I will be trying this for a change. I just cooked your chop suey last week. Hubs and I both like it! Thanks for sharing with SYC. LOve it! Going to make it for our Octoberfest/Halloween party this weekend! This looks like one of those perfect wintery meals to create when you want something hot and warm to fill you up when you get in. It also looks quite easy to make too. This looks yummy! I love sausage and that sauce sounds delicious. Can't wait to try it! Thanks for linking up to our Comfort Food party! Oh yum, that sounds good! Finding the local gems is fun! So quick and easy! Pinning this for when I pick up some rope sausage!